Gun rights advocates asked President Donald Trump to do away with a new Social Security rule that seeks to make it more difficult for Social Security recipients to possess a firearm. In December 2016, the Social Security Administration finalized a new directive saying the agency would provide data to the National Instant Criminal Background Check System on Social Security disability recipients and Supplemental Security income beneficiaries if they were deemed “mental defectives,” or unable to think legally for themselves. Our attorneys at the Hankey Law Office have legal experience under their belts, especially when it comes to Social Security disability issues. Do not hesitate to get in touch with a qualified member of our legal team by calling our Indianapolis offices today at (317) 634-8565 or (800) 520-3633. A good reason for filing for Social Security benefits at age 62, three years earlier than the retirement age of 65, is that retiring at an early age could leave you with a want for income. According to a survey administered by the Employee Benefit Research Institute, 33% of workers believe they will retire after the age of 65, but only 19% of them actually do. Also, 90% of workers say they will not retire before they reach age 60, but 35% of workers retire that early. A 2015 report titled “How America Saves” released by The Vanguard Group showed the average 401(k) account balance for the 55-64 age group is $177,805. If you take away 4% of this income per year, that sum translates to a mere $7,100 in annual income. So, it definitely is a plus if a person retiring at age 62 files for Social Security benefits around this time. Hire our attorneys at the Hankey Law Office to file, appeal, or follow up on your Social Security disability benefit claim. Seek the legal assistance of a qualified member of our legal team today by calling our Indianapolis offices at (800) 520-3633 to get help obtaining your disability benefits right away. The United States Social Security Administration is planning to use $300 million to upgrade its Information Technology systems. However, many legislators are worried that the federal agency will spend recklessly without actually achieving results. Among its planned upgrades is the goal to move its storage to the Amazon Web Services cloud and incorporate more agile software development practices. When asked why they want to make this change, National Council of Social Security Management Associations president Rick Warsinskey said the SSA’s current infrastructure runs on common business-oriented language (COBOL) programming. Unfortunately, it has upload speeds of .25 megabits per second (Mbps), which is 20 times slower than the speed at which home internet services run. The system is tasked with churning out Social Security numbers and finalizing unemployment and retirement payments. Talk to one of our attorneys at The Hankey Law Office in Indianapolis before filing for Social Security disability benefits to get advice on how to proceed with your claim. Call our offices today at (317) 634-8565 or (800) 520-3633 to discuss your situation. John Pleuss, an administrative law judge in charge of deciding Social Security disability claims, was accused of making offensive physical descriptions of claimants. According to the Milwaukee Journal Sentinel, Pleuss made crude descriptions of the people who came to his court for federal disability assistance in his notes. He described one person as a “very black, African-looking woman (actually a gorilla-like appearance).” Another description that Pleuss made of a claimant was “young, white, female; long brown hair; attractive; looks innocent.” The Milwaukee Journal Sentinel interviewed people who worked in Pleuss’ office in Madison to confirm that the notes were indeed written by Pleuss. The notes were first covered by a conservative website called Wisconsin Watchdog. Association of Administrative Law Judges President Marilyn Zahm said Pleuss’ notes were “shorthand descriptions” that he used to familiarize himself with a case. She said the descriptions were taken out of context. If you were recently disabled, you deserve a fair, unbiased hearing to receive Social Security disability benefits. 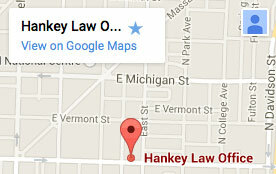 The Indianapolis Social Security disability attorneys at The Hankey Law Office can help you file for a claim. Call our office at (317) 634-8565 to speak with a qualified member of our legal team. Fifty-five-year-old Muncie, Indiana resident Kimberly Harper received a three year prison sentence for stealing almost $200,000 in Social Security disability benefits. The benefits belonged to her children, but instead of providing her kids with housing and food, Harper spent the money selfishly. According to United States Attorney Josh Minkler, Harper did not provide proper care for her children and left them under the care of her parents for years, disregarding them for almost 20 years. Instead of caring for them, Minkler said, “she stole from them, including her son who was born with a severe mental disability.” Court documents showed that Harper stopped caring for her four children – including one who suffers from a severe form of autism – when they were toddlers in the 1990’s, but she continued raking in money from food stamps, public housing, and disability services. With years of committed and personalized dedication to a number of Social Security disability cases, the attorneys at the Hankey Law Office in Indianapolis can help you handle your benefits. Our experience filing and appealing Social Security disability claims is unmatched. Call our offices today at (800) 520-3633 to learn more about our services. Social Security Turns 80, What Now? The Social Security Administration marked its 80th birthday on Aug. 14, 2015. However, the agency is besieged by its own problems. With the disability benefits fund scheduled to be depleted by 2016, people in power and legislation are thinking of ways to stop this event from happening. Former Florida Governor Jeb Bush has suggested privatizing the Social Security Administration to solve the problems that the Social Security Disability Insurance program is currently facing. Senator Rand Paul (Republican of Kentucky) is more for raising the eligibility age and changing premiums, which would equate to a decrease in monthly benefit payouts for recipients. It should be remembered that former President Ronald Reagan immortalized “our nation’s ironclad commitment to Social Security” when he signed a bill that sought to preserve the agency and its programs on April 20, 1983. The process of applying for and receiving Social Security disability benefits can be problematic and tedious at times. If you are encountering such difficulties and you reside in Indianapolis, get in touch with our attorneys at The Hankey Law Office by calling our offices today at (317) 634-8565 or (800) 520-3633. One thing to remember about Social Security disability benefits and retirement benefits is that when a recipient reaches full retirement age, his or her disability benefits merge with his or her retirement benefits, thereby making them one. Any recipient cannot receive both retirement and disability benefits at the same time in one earnings record. Sometimes, a person may contract an illness so debilitating or suffer from injuries that are so life-altering that the Social Security Administration will expedite the disability applications of these people. This program is called Compassionate Allowances. This program makes it possible for the administration to single out people with the most severe illnesses or medical conditions to facilitate a much faster disability benefit process for them, provided the administration is given the proper and complete medical documents required. If you have been working in the United States for a certain length of time, you are eligible for Social Security disability benefits. If you have questions regarding how to obtain your benefits or if you need legal representation for issues or concerns regarding your benefits, get in touch with our attorneys at The Hankey Law Office in Indianapolis by calling our offices today at (317) 634-8565 or (800) 520-3633. When today’s 48-year-olds retire in 2034, both the Social Security Administration’s disability and retirement funds are projected to be completely depleted. According to Social Security disability trustees, if Congress doesn’t make moves to prevent this from happening, Social Security disability funds could be depleted by the last quarter of 2016. This move is via Congressional reallocation, which both the House of Representatives and the Senate – working together – last did in 1994 when they moved money from the retirement fund to the disability fund. Social Security disability trustees said on Wednesday, July 22 that the healthcare spending slowdown has shored up the funding outlook for the disability program. They added that because of this, the government would only be able to give out 86% of the scheduled benefit payments. The Social Security disability insurance program provides much-needed financial assistance for individuals with disabilities who qualify. If you live in Indianapolis and you need legal assistance filing for Social Security disability benefits, contact the experienced attorneys at the Hankey Law Office by calling (317) 634-8565 today. The Social Security disability system is a security net for 90% of American workers and their families, in case they become disabled and are no longer able to work for their wages, an article on the Center for American Progress website stated on June 16. The Organization for Economic Cooperation and Development (OECD) has attested to the stringent requirements of the program’s eligibility criteria, as only those with significant disabilities and illnesses may qualify. An American citizen who was worked for a certain length of time and who has had the misfortune of suddenly contracting a disease or an illness can seek comfort in the Social Security Disability Insurance program. If you wish to file for Social Security disability benefits in Indianapolis, let our attorneys at the Hankey Law Firm help you throughout the complicated application process. Call our offices today at (317) 634-8565 to discuss your situation. According to the annual report by the Social Security Administration’s (SSA) Board of Trustees, the trust fund that supports the Social Security Disability Insurance (SSDI) program could be depleted by 2016, US Finance Post reported on July 29. Treasury Secretary Jack Lew suggested that more income from taxes be directed at disability benefits to help keep the Social Security disability insurance program afloat. Lew stated that changes need to be made immediately, to avert disaster in the future. The anticipated financial shortage in disability funds make it even more important that those who need it apply for disability benefits as soon as possible. The attorneys at the Hankey Law Office understand that the application process is often confusing, and one of our experienced social security disability attorneys may help you complete and file your request for aid. Likewise, if your claim has been denied, we may help you file an appeal. To discuss your situation, call our Indianapolis offices at (800) 520-3633 today.